David Warner was sent on his way on 13. 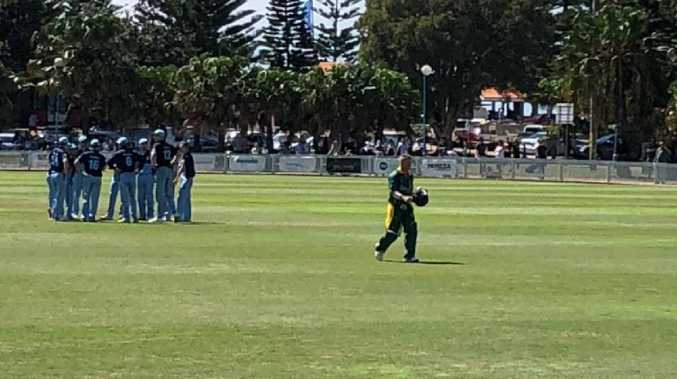 DAVID Warner has been sent on his way early on in Randwick-Petersham's clash against Steve Smith's Sutherland at Coogee Oval. 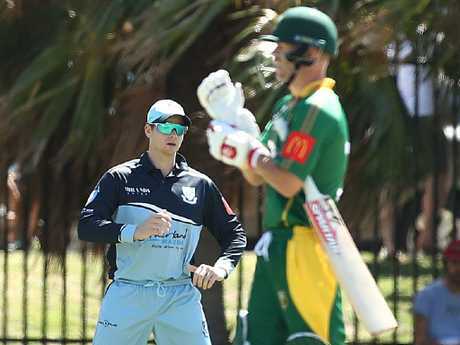 The banned international opener took guard for the first time since his highly publicised walk-off against Western Suburbs and was dismissed for 13 off the medium-pace bowling of Austin Waugh, the son of former Test and ODI skipper Steve. Warner was reported to have slashed at a wide ball from the 19-year-old and sent the cherry straight into the hands of leg-spinner Daniel Fallins at backward point. Cricket.com.au reporter Samuel Ferris revealed the "healthy" crowd let out a huge groan as Warner left the field. Former Aussie skipper Smith, who will bat next innings against Warner, was fielding in the slips. Former Aussie all-rounder Shane Watson, who retired from international cricket in 2016, also took the field for Sutherland. Unfortunately for Smith and Watson, the fall of Warner didn't slow Randwick Petersham down. Opening partner Daniel Bell-Drummond - an Englishman making his first grade debut for the club - scored at a nice clip to move into the 90s as the home side moved to 3/191 in the 38th over. Randwick-Petersham president and former Aussie fast bowler Mike Whitney showered praise on Warner from the sidelines. David Warner was out early and spent quality time with the juniors. "As the president of the club I couldn't have asked any more from him," Whitney said on FOX Sports. The former seamer said Warner had been spending quality time with Randwick-Petersham's seven grade sides, including a host of juniors. 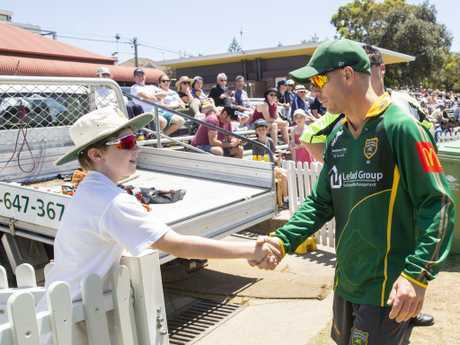 Whitney said a young boy named Sam travelled all the way from Ballarat with his mum after sending the club a letter about how much he wanted to see Warner play. "They've been walking around the ground throwing the footy to each other. I know I want to see Randy-Peets take the win but that moment there ... Sam's mum cannot believe what's gone on and she's thanking me profusely," Whitney said. "I nearly shed a tear. David was saying to him 'Come on mate, you're hanging out with me all day. It's an amazing story." How times change: Smith and Warner — still both ranked in the top 5 world Test batsmen — competing against each other at club level. Captain and first drop Anthony Sams chipped in with 55 but NSW player Jason Sangha, who scored his maiden Sheffield Shield century during the week against Tasmania, was bowled for a second-ball duck. NSW quick Daniel Sams joined Bell-Drummond at the crease as the pair set the platform for a late-innings assault. Smith was called upon to send down some leg breaks and was tidy as he had 0/28 off eight overs with 12 overs remaining in the innings. Smith and Warner, both serving bans over the Newlands ball-tampering fiasco in March, have received ongoing support for their year-long suspensions to be scrapped as they fight to win back favour in the community. Health Medical professionals praise course. 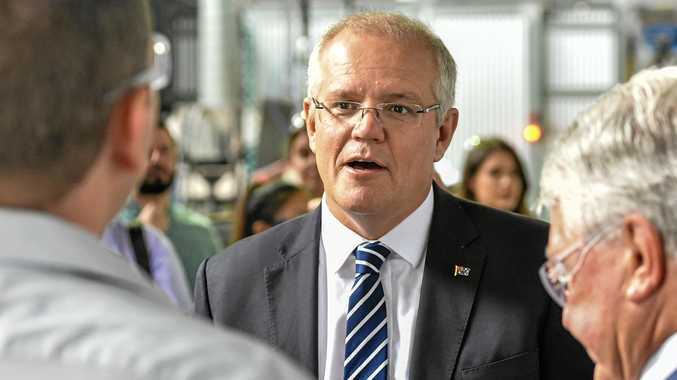 News This is where you can vote early for the 2019 election.